Hello there and thank you so much for stopping by today.....hope this week is treating you well. I am enjoying a few days "home alone", well I say alone but obviously its me, two kids, two dogs and the cat, but y'know what I mean! My Mum decided to scatter some of my Dads ashes on Culloden Moor in the North of Scotland (this was of great interest to him) and my hubby decided to chaperone as his daughter is due to go into labour at any moment. After everything that has been going on recently, this is welcome break for me too! Not least because I'm spending a little more time at my craft desk then I otherwise might! Lovely card Lisa, a lovely place to take your Dad's ashes too - we stay very close to there when we rent a cottage in the summer - Culcharry (1 mile from Cawdor) a very beautiful place to finally rest. This is gorgeous Lisa, I love the sweet image, pretty papers and fabulous design. This is a pretty card Lisa, such lovely colours and sweet image. gorgeous, love how you did your lace too! I do that with my ribbon!! 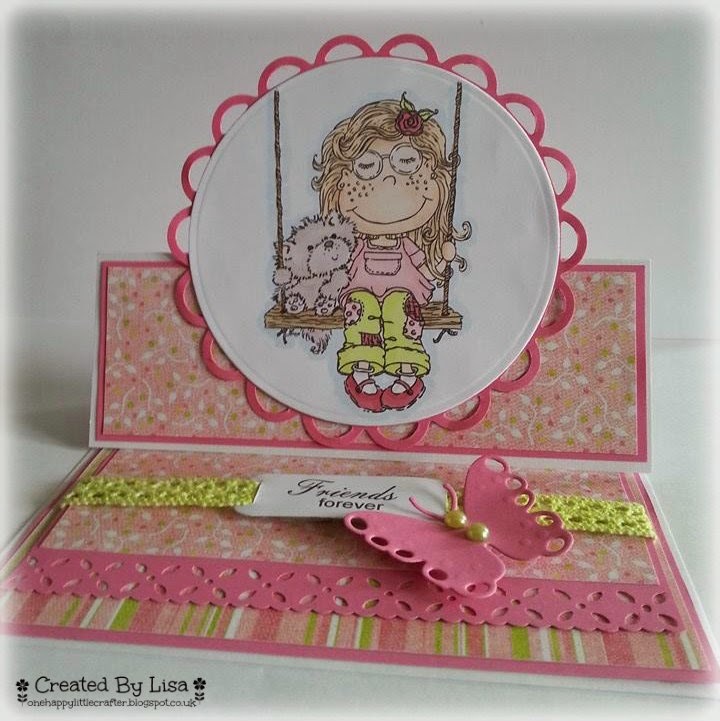 so gorgeous lisa.fab sweet image and i love your pretty colour combo and papers.